Love chips? Roasts? Cooked breakfasts? Samosas and Sausages? 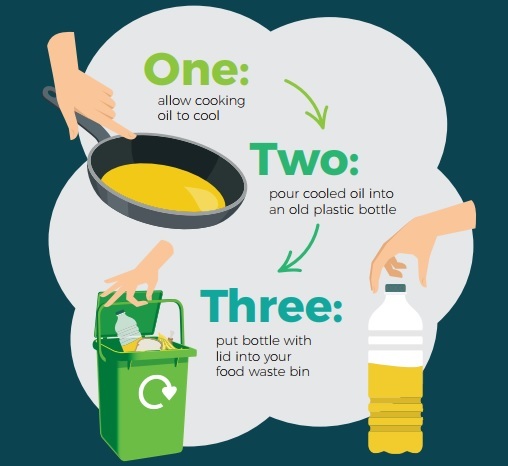 All are delicious, but they do leave greasy leftovers..….which South Oxfordshire and Vale of White Horse District Councils can now take care of thanks to their new cooking oil recycling service for residents. Oil is collected every week as part of both districts’ food waste collections. After cooking, any leftover oil should be allowed to cool before being poured into a plastic bottle no bigger than a 1 litre size. The bottle and its contents can then be placed into the resident’s kerbside food waste caddy along with other food waste and put out for the weekly collection. One litre of cooking oil can generate enough electricity to make 240 cups of tea! Note: For those residents not wishing to use a plastic bottle, oil can also be poured straight into the caddy along with other food waste.